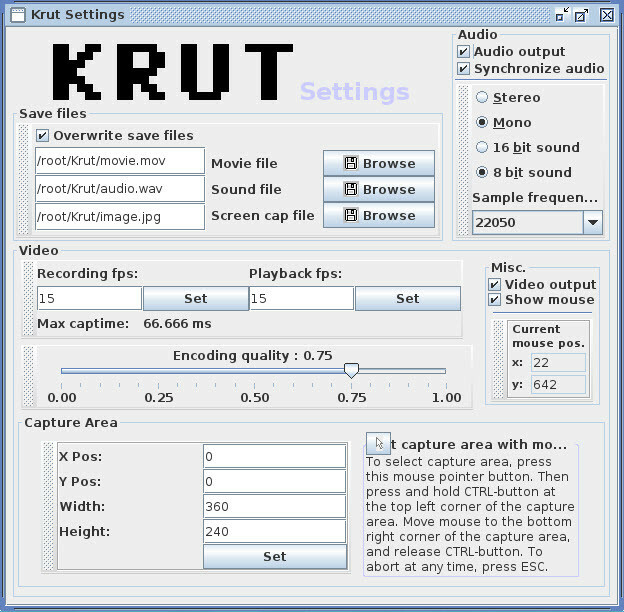 Screen recording (video capturing) in RHEL7 using Krut We have so many screen recording software’s but krut screen recording software is very easy to use no need to install just setup java, jar OR jdk that’s you can easily run krut. we can also take an screenshot of multiple monitors (In case if you have multiple monitors connected). We can also record screen recording as a video. We can also set an Screen capturing area width and height which is very useful option available in krut software. Krut is required run java you have install java, jar and jdk. You can change the settings whatever you want. Thanks for your nice and very very informative article.It helps a lot for youtubers and other users who like to record there screen while studying Linux. If its possible for you i will like to know how to record screen on a RHEL5 or RHEL6 Machine. If you like you can share links with me or u just mention it at the end of this article.